The Indian Army unit is impressed with Russian-made weapons such as anti-tank rocket launchers, Kalashnikov guns and Dragunov SVD sniper rifles. Russian and Indian army units taking part in the Indra-2014 urban anti-terror exercises are learning from each other’s different approaches. During an operation when an enemy town was captured, the Russian military actively used armoured vehicles, while Indian units placed emphasis on infantry operations. 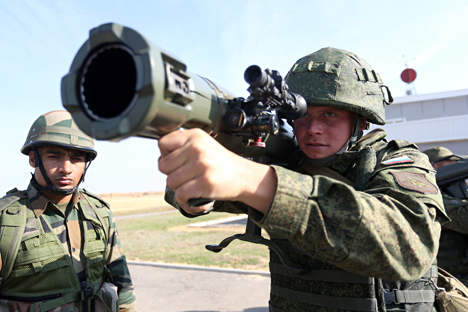 The Indra 2014 joint tactical exercise started on September 23 at the Prudboy training range in the Volgograd region and will last until October 2. Military personnel from both countries are working out joint actions for protecting important state facilities, accompanying convoys, and the neutralization of illegal armed formations. Brigadier Birbal Singh Jakhar also noted the different approaches of the two armies in storming a building, during a training operation to free hostages. Russian troops began clearing the lower floors, while their Indian counterparts began the assault from the upper floors via the stairs. The Indian brigadier stressed that the experience was beneficial for both parties and is worthy of analysis and study. The Indian Army unit taking part in the drills will inform their chiefs that the Russian weapons used in Indra are worth purchasing, the Russian Southern Military District's press service said. The Indian side “plans on informing the leaders of the Indian Army that it is worth purchasing Russian weapons and motorized infantry equipment,” which were used by the Russian motorized troops, the press service said. The Indian servicemen tried their hand at using Russian-made weapons during the exercise, firing anti-tank rocket launchers, Kalashnikov guns and Dragunov SVD sniper rifles. Earlier in July, Russia and India conducted naval exercise Indra-2014 in the Sea of Japan. Russian-Indian joint air force drills Avia Indra-2014 took place in late August and early September. Indian Air Force commanders expressed interest in the Russian surface-to-air missile systems used during Avia Indra-2014. “They have expressed great interest in our systems, they probably need to modernize their weapons arsenal,” Maj. Gen. Babakov, head of the Russian Air Force's anti-aircraft missile troops, said last month. India is particularly interested in Russia’s S-400 (SA-21 Growler), S-300PM (SA-10d/e), Pantsir-S1 (SA-22 Greyhound) and BUK surface-to-air missile systems, according to Maj. Gen. Babakov. Based on reports first published by RIA Novosti.